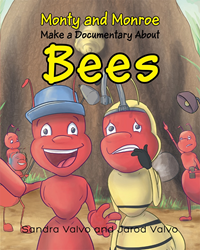 Recent release “Monty and Monroe Make a Documentary About: Bees” from Page Publishing authors Sandra Valvo and Jarod Valvo is an exhilarating adventure of two friends and their film about a small, but important creature. Sandra Valvo and Jarod Valvo, have completed their new book “Monty and Monroe Make a Documentary About: Bees”: a nail-biting children’s story of two brave ants that propel themselves into danger, all for a documentary. Will they make it out alive? Sandra and Jarod are a mother and son team. They are thrilled to be collaborating together in their first children's story book adventure. They are normally writing short films together and enjoy being involved in the Southeast film community. Stories of all forms have always been and will be a part of their lives whether it is voraciously reading, writing, film making, or acting. Published by New York City-based Page Publishing, Sandra Valvo and Jarod Valvo’s book is an exciting tale of two ants on a mission to make a documentary while learning about bees along the way. Two film making ants from England named Monty and Monroe decide to make documentaries. In their first adventure, Monty straps a camera to Monroe's forehead and propels him into the dangers of the beehive for the sake of the documentary and maybe to acquire a little honey too. Will Monroe succeed? And if so, what will the ants learn about the bees? Find out in this thrilling adventure. Readers who wish to experience this mesmerizing work can purchase“Monty and Monroe Make a Documentary About: Bees” at bookstores everywhere, or online at the Apple iTunes store, Amazon, Google Play or Barnes and Noble.